Amada Armenta is a doctoral candidate in the Department of Sociology at UCLA and a Predoctoral Research Fellow at the Center for Comparative Immigration Studies at UC San Diego. Her research has been supported by various organizations including the National Science Foundation, the American Society of Criminology, the American Sociological Association, the Social Science Research Council, and the Center for Comparative Immigration Studies. On Tuesday, April 19th, 2011, Armenta discussed her research on the implementation of the 287(g) program in Nashville, Tennessee during a seminar held at UC San Diego. After the seminar, she sat down with PROSPECT to answer a few questions. PROSPECT: Just for the readers who may be unfamiliar with your work, could you tell us a little bit about your specific research and what it aims to do? ARMENTA: Sure, so my research was broadly about immigration enforcement, but more specifically about a particular immigration enforcement policy called the 287(g) program. The 287(g) program, which was written into a federal immigration law in 1996, allows law enforcement agents to do the work that formerly only ICE agents could do — so they become deputized immigration enforcement officers, they receive training, and then they’re allowed to enforce immigration laws in their towns or localities or jails. There are 72 287(g) programs across the country. The reason the program is so interesting to study is because it demonstrates an expansion of the federal government. If they let local-level officers do things that only federal officers could do before, immigration law enforcement is expanded greatly. The point of me going to Nashville and studying it was really to understand how immigration enforcement happens on the ground. There has been a lot of emphasis on studying immigration enforcement at the border, for example, but immigration enforcement happens in cities and towns across the country. There are immigrants in places you wouldn’t imagine and that was really the emphasis behind going to Nashville to see what was going on. PROSPECT: Do you think that the programs such 287(g) are fundamentally flawed or do the issues come mostly from implementation and enforcement? ARMENTA: Right. Wow, that is a difficult one to answer. So, to the extent that one thinks that immigration enforcement has to happen because a country needs to protect its borders, obviously it needs to enforce immigration law somewhere. The priorities of this administration and the previous administration have been to keep targeting immigration enforcement to smaller and smaller groups of people. In this case, for example, the target is a group of people called “immigrants.” In that sense, the policy tends to remove people who are potentially dangerous and therefore does not seem as flawed. In terms of implementation, however, the net is always wider than the target. So the government can say it is only removing criminals because it is only removing people who are in jail, but people who are in jail are not all criminals. Officers are not necessarily out to get immigrants; immigrants are just a vulnerable group because they don’t have ID or because they are out on the streets a lot. PROSPECT: You mentioned that the notion of removing criminals from our country reels in popular support for policies like 287(g). Do you think that official U.S. policy toward immigration is largely a political response to popular demands, and/or is it a question of national security and border protection? ARMENTA: Overwhelmingly, the general public is supportive of restrictive immigration policy. 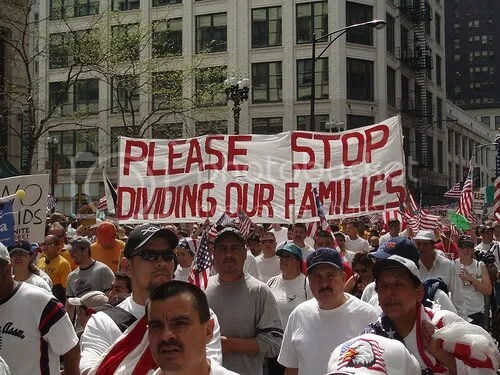 They usually say that they support having lower numbers of legal immigration, more immigration enforcement, and deporting people who are here without authorization. However, when it comes to actually implementing immigration laws, the public does not stand as much behind the policies when they see the actual person who is going to be deported, for example. So it’s really easy for people to symbolically get behind a policy that gets rid of people they think shouldn’t be here, but when they see the policy’s effect, they are not always so supportive. The other thing is that the public’s views are not consistent. So while they favor restrictive immigration policies, the public also favors the DREAM Act, and the public has also, depending on how the questions are worded and polled, supported an immigration amnesty program that would grant legal status to people who are currently here without status. So how immigration policy actually ends up happening is really interesting. You know, there are these fights on Capitol Hill, in Congress, where the really powerful factors end up being business and corporation interests. These entities, who want workers, can team up with organizations that care about immigrants. And together, they do have a mutual interest — only for different reasons. PROSPECT: Could you comment on whether or not you believe current U.S immigration policy to be a sustainable solution for the future? Why or why not? ARMENTA: I mean, it’s sustainable in the sense that immigrants will keep coming no matter what the federal government does. Immigrants will come because they have their own reasons for coming. Immigrants will come because they have family here or because they need to work and they feel like they have no options in their country of origin, and the federal government will keep creating policies that try to restrict their entry, and so the system actually is absolutely broken. There are 18 million people who are here without immigration status, so obviously something needs to change. It’s not in the interest of a country to have so many people living here without any kind of status. Therefore, it’s not sustainable in the sense that it doesn’t necessarily work and change is needed; but how it could be fixed is fundamentally so impossible because the problems are human. Like I said, people need jobs, so people will come, even if it’s illegal because individuals want to survive. PROSPECT: What do you think is the future of U.S. immigration? Where does the seed for immigration reform need to be planted? ARMENTA: Honestly, right now, I feel like we’ve been waiting for immigration reform for years and politically, the possibilities are invisible: I don’t see them at all. Immigrant advocacy organizations on the national level don’t see them either. It seems like the biggest hope is for the DREAM Act, which gives status to a very small portion of unauthorized immigrants who are the most sympathetic. This refers to people who arrived here when they were children; these people are American, they went to American schools, they feel American, but aren’t technically American. But even that failed in Congress recently, so I mean amnesty or legalization will happen someday because you can’t have this many people without status, but politically, it’s just not even on the radar. PROSPECT: What are the implications of programs such as 287(g) in Nashville and across the country? ARMENTA: I mean, the implications are when you have screenings in a jail, what ends up happening is that people get deported because they wind up in jail. And the ways that they wind up in jail, like I said before, are not necessarily because they are criminals but because they have the status in this country that makes them vulnerable. I mean, people are going to jail for extended periods of time for driving without a license or driving with a broken taillight, et cetera. So as long as screenings are happening in jail, and as long as people in jails are not all criminals, more people will get deported, more families will be separated, and the federal government will have the comfort of saying that they are deporting criminals because those people wound up in jail. But to immigrant communities, they are deporting breadwinners, parents and siblings, family members. And what really ends up happening, in immigrant communities especially, is that people become very afraid of the police, who aren’t necessarily enforcing immigration laws, but simply doing their jobs the best that they can. They just end up coming in more contact with immigrants because there are large immigrant populations in areas that they patrol. But if you are here without status, then you really don’t see the difference between a police officer and an ICE agent. To them, it’s all part of the same system where coming in contact with a police officer may result in deportation. PROSPECT: Just one last question — we talked about popular support. What is your response to people who argue that racial profiling and screenings of this nature are effective methods of removing undocumented immigrants who are essentially reaping the benefits of the American legal and social system? ARMENTA: Unauthorized immigrants, of whom there is a very large number, are here for a reason. They are workers, and they are here because people hire them. And I think that it’s clear that unauthorized immigrants contribute to our economy, not only as workers, but as taxpayers and consumers. They buy goods, they rent apartments, and they have American family members and children. So their ties to the country are very strong and so I would say that it’s important for a country to secure its borders; I agree that the country has a sovereignty to do so, but at the same time, there is a political and economic reality in this country that we have to face. Employers still hire these workers even if it’s illegal, and enforcement tends to focus on the workers instead of the people who hire them. Photo courtesy of Time Out Chicago.